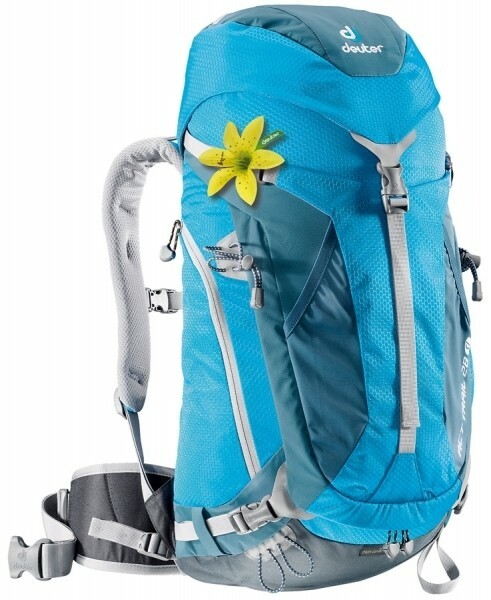 This backpack is particularly well suited for hiking, via ferrata or for a city tour. The ACT Trail is back contact and thus provides optimal weight distribution and control. The flexible support system adapts to every movement. The padded hip fins have bags that are suitable for valuables. The shoulder straps are anatomically cut and have stabilizer straps. The robust 3D air-mesh reference air-conditioned and supported the excellent ventilation of the Aircontact system. A ventilation channel is created between the Aircontact cushions. Two Aircontact pads in special breathable hollow chamber foam ensure a uniform load distribution. By a pumping effect in the Aircontact pads, an air exchange with every movement brought about, thus ensuring a back ventilation. The result: 15 % less perspiration than with previous body contour packs. Anatomically formed hip fins for freedom of movement and the body-hugging fit. Flexible, tensioned Delrin U-shaped frame provides with little extra weight for the stability of the system. He effortlessly follows the most varied movements. In conjunction with the body-hugging fit of the pack, it offers a pleasant non positive behavior support with a uniform weight distribution and good load transfer.